Hades: You sweating like a human, brother. Next, it will be tears. I think there is a certain amount of humor in the fact that Wrath of the Titans is essentially a take-two on this movie series. Wrath was certainly felt in regards to the 2010 film (which was in no way helped by the 3D that was then used as the key example of bad usage of the format to compare other films to). Now we have the sequel to a film that doesn’t seem to have much high regard, yet made a huge box office splash during its release. For being a sequel, Wrath is certainly an improvement. It follows a lot of familiar sequel tropes, which involves being bigger and badder, yet retreading a lot of the same plot beats from the first film. 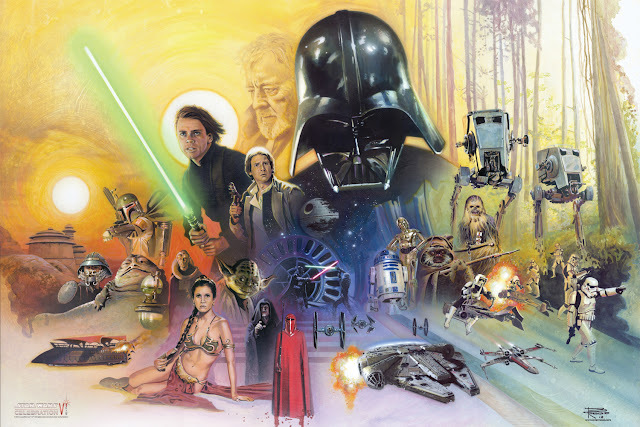 Fortunately, the key element is that this film is more fun than the first, which is good, because I did enjoy the idea of remaking the original 1981 Clash of the Titans, but was disappointed with what came out of that. 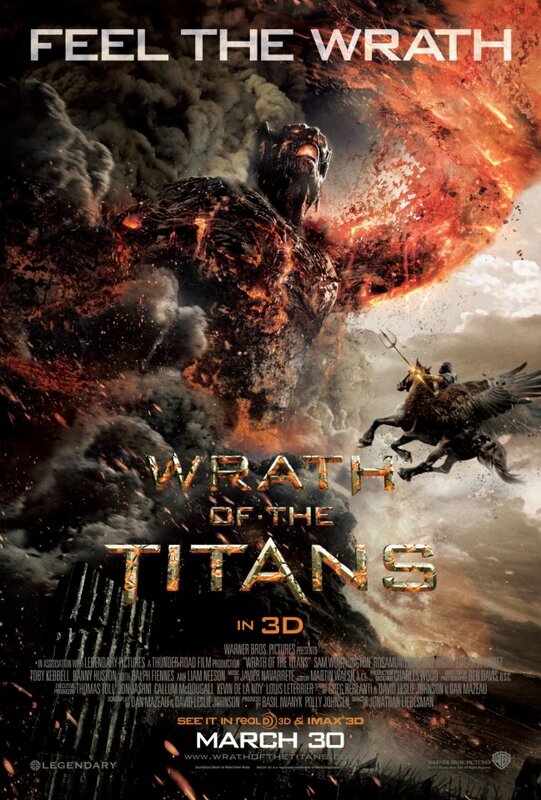 Wrath of the Titans may not become a cheesy classic like the original Clash, but at least its decent matinee fun. The story picks up 10 years after Liam Neeson’s Zeus declared the immortal phrase, “Release the Kraken.” Perseus (Sam Worthington), the Kraken Slayer, despite his status as a demigod (as he is the son of Zeus), has decided to continuing living his life as a simple fisherman, with his 10-year old son, Helius. 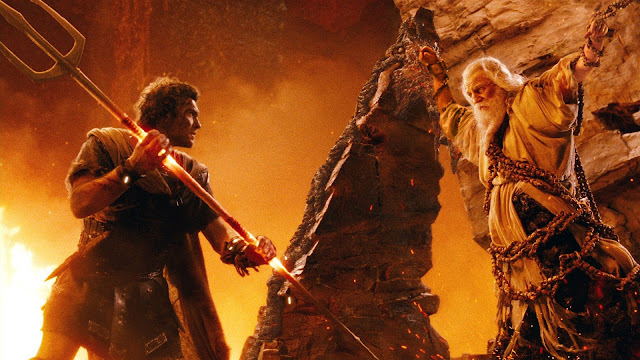 Meanwhile, due to trouble arising in regards to the fading supremacy of the gods, as humanity’s lack of devotion is now taking away their power, Zeus, along with Hades (Ralph Fiennes) and Poseidon (Danny Huston) travel to the dungeon of Tartarus, in an effort to find a way to keep the imprisoned Titans at bay. 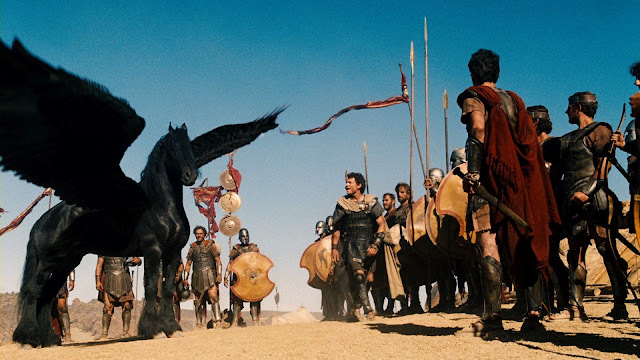 However, Zeus and Poseidon are betrayed by Hades, who has teamed with Ares (Edgar Ramirez), the god of war and the (apparently under-appreciated) son of Zeus, who have made a deal with Kronos, leader of the Titans, to capture Zeus and siphon over his powers. As these power shifts are occurring, evils from the underworld begin to be unleashed upon humanity. While Perseus has previously rejected Zeus’ call for help, foreboding dreams that involve his son force him to no longer ignore his calling. After slaying a Chimeran threat (my enjoyment of Greek myth is making me use such specifics), Perseus travels on his trusty steed Pegasus to enlist the help of Queen Andromeda (Rosamund Pike), who has been heading up her own army to combat the evil threats; as well as Agenor (Toby Kebbell), the demigod son of Poseidon, to assist in a quest to travel into the underworld and rescue Zeus. Despite having to deal with many obstacles along the way, stopping the rise of a Titan who threatens to destroy all of mankind is the most important goal of all and Perseus must once again choose to accept his role as hero. I give some credit to the writing team in this film for coming up with some decent ideas. The thought of the Greek gods disappearing from existence due to humanity’s lack of faith in them any longer, along with the notions of having these gods, demigods, and titans dealing with the bonds that tie family together, as they are forced to hurt/murder one another are intriguing. 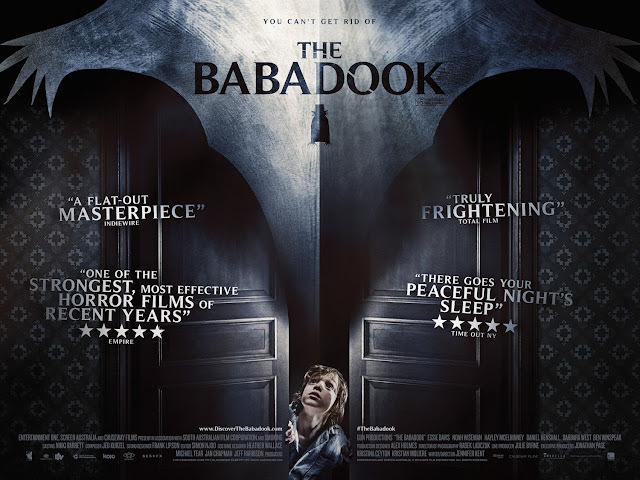 Unfortunately, this film does not really think so, as all of these plot beats are thrown out there and rushed through, in favor of delivering a 90-minute (without credits) experience that is filled with CG monsters, some neat production design, and a lot of good actors delving into campy territory. It is just also too bad that the film still doesn’t fully embrace its cheesiness, instead trying to strike a balance of epic cheese and grittiness (an admittedly terrible-sounding snack food). I want to address these gods. It would be hard to argue that Liam Neeson and Ralph Fiennes are anything but very talented actors, who bring a certain level of gravitas to the roles they tend to play. In this film, as Zeus and Hades, the two get the chance to really dig into terrible dialogue and participate in moments so cheesy that I wish more 80s synthesizers could have been brought into the score for this film. If this film series really wanted to embrace the idea of being a fun blast that unites all of the greatest hits of Greek Myth into one film, there should have been way more scenes involving all out God battles, with lightning bolts being fired away at multi-armed creatures. As it stands, we get too few of these types of sequences, though watching Ares and Perseus engage in a wrestling match to see who can destroy more of the set with their head was quite nice. 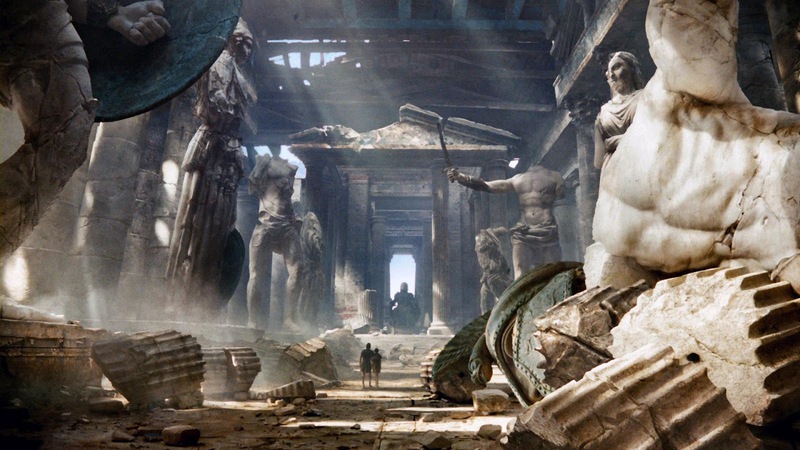 With that in mind, a lot of fun that I had with Wrath of the Titans did extend from my level of appreciation for a lot of the big action set pieces that occur. 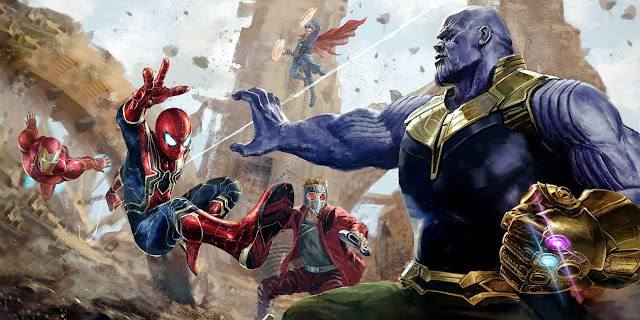 While the first film felt much more closed off (bad sign when Titans should supposedly be clashing and Krakens are being released), this film does a lot to establish a much larger scale to what’s occurring. I still could not say that I really cared too much for or felt very connected to some of the set pieces, in terms of what it means for the characters involved, but watching Perseus and various soldiers interact with raging Chimeras, Cyclopses, and the towering Kronos himself, among other things, was certainly a lot of fun. Additionally, seeing lots of wide shots of the environments these characters were supposedly in was refreshing. Director Jonathon Liebesman brings a little of the same down ‘n dirtiness of his previous film, Battle: LA, to this film, but manages to not forget that this is a big film with large CG creations in it. Speaking of the CG and the production work on this film, I think Wrath of the Titans does a pretty solid job at delivering a lot of good looking spectacles. My favorite would have to be the design of a labyrinth depicted in this film. 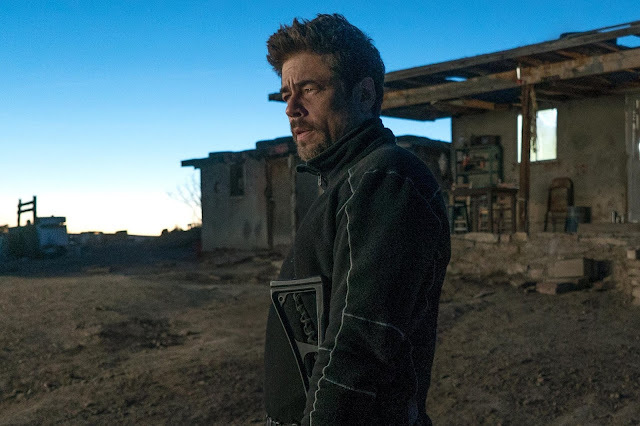 It is fittingly overwhelming to watch and comprehend, as it constantly shifts itself and features many, seemingly deadly, twists and turns, but it was certainly a creative thing to add to the film. However, on the other side of this praise, I did wonder why there wasn’t more to a place like this (Is there really just one Minotaur lurking around a huge environment such as this?). Other areas, such as the Temple of the Gods, were also interesting to see, mainly due to seeing the setup of such an area, only to see it demolished later on. And finally, the interactions between live action characters and various CG monsters was something to admire. Watching Perseus face off against a Chimera, which managed to incorporate a number of long shots, where the two interacted, was another way I think this film succeeded in spectacle. Addressing the other actors is somewhat of a lost cause, as very few of them make the film feel more alive. 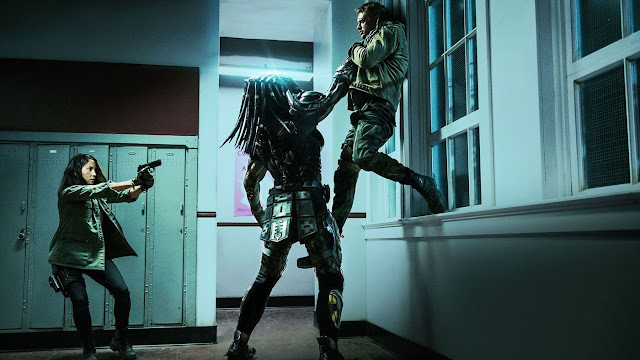 Sam Worthington continues to fill the role of action lead, minus a whole lot of charisma, but at least his physicality is put to use throughout the film. No sign of either female actress (Gemma Arterton or Alexa Davalos) from the first film, but Rosamund Pike’s presence (playing the Davalos role in an entirely new way) at least gives us a good-looking companion. 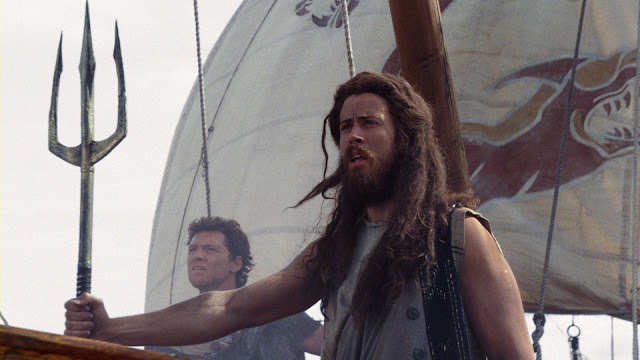 The film does get to have fun with Toby Kebbel’s performance, which brings a nice amount of lightness to a story that deserves to take itself less seriously. That aspect is only amplified further with the surprise addition of Bill Nighy as the god Hephaestus. In a performance that almost tears away the serious reality that this film is trying to exist in, Nighy gets to have almost too much fun at calling attention to how silly the film really is. 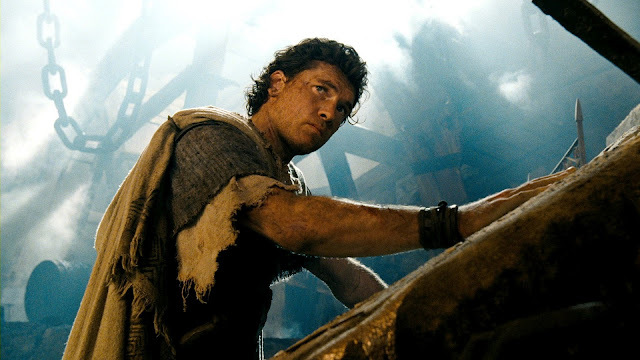 I’ll also call a little attention to Edgar Ramirez as Ares; not because he is particularly good in the film (he’s certainly decent at slumming), but mainly because it is nice to see a seemingly random, but talented actor be cast in such a prominent role (check out Ramirez in Carlos or Che). Given that this film wants to play fast and loose with Greek Myths, I couldn’t help but think of a similar property, the God of War video game series. The interesting thing is, I was more invested in the story and characters in that game than this film. Wrath of the Titans gets enough right to be an entertaining film. It is a slight step up from the first film, given that everyone seems to be having more fun this time around. However, the plotting and attempts at creating serviceable characters are basically inconsequential. The film is an excuse to put of plenty of CG beasties in and allow good actors to speak in godly accents. That continues to sound like a fun idea; I just wish it was more fully embraced. Zeus: You will learn someday that being half human, makes you stronger than a god.